Black Bond Hall Bed and Breakfast01206 735776work Bed & BreakfastAA 4 Gold* Highly Recommended Bed & Breakfast. Black Bond Hall nestles in its own grounds of just under ¾ acre just off the B1025, 5 miles south of Colchester and 3 miles from Mersea Island. The setting is in a quiet lane surrounded by open farm land with the house delightfully in its landscaped gardens. The house steeped in history has exposed beams in the well appointed main rooms with a high standard of detail. The 2 double bedrooms have their own bathroom/shower room facilities. 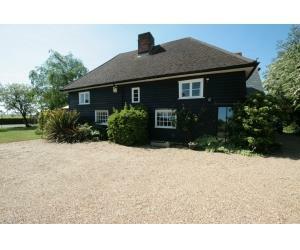 The location gives easy access to Mersea Island, Colchester and Rowhedge. Excellent for visiting Essex University There are nearby golf courses, Beth Chatto gardens, Wildfowl reserves, and all the amenities of Essex/Suffolk borders. Cyclists & walkers welcome. There is ample off road parking and a hard tennis court available by arrangement. On arrival expect to be served with homemade cake and tea or coffee. Delicious breakfast is sourced from local produce and is served in either the modern breakfast room overlooking the garden or traditional dining room. Coffee can be served on the sheltered terrace. The grid shows the prices and daily availability from Thu 18 Apr 19 to Fri 26 Apr 19. It's easy to check availability for particular dates; just use the calendar to choose the check in date, select the number of nights and click the 'Search' button..
AA 4 Gold* Highly Recommended Bed & Breakfast. Black Bond Hall nestles in its own grounds of just under ¾ acre just off the B1025, 5 miles south of Colchester and 3 miles from Mersea Island. The setting is in a quiet lane surrounded by open farm land with the house delightfully in its landscaped gardens. The house steeped in history has exposed beams in the well appointed main rooms with a high standard of detail. The 2 double bedrooms have their own bathroom/shower room facilities. Gill and Andrew Crayston offer great hospitality and will make your stay enjoyable and very comfortable. Cyclists & walkers welcome Children welcome from age 12.